I know I’m asking a lot. After spending most of the past two hours climbing some of Blue Derby’s lower mountain biking trails, my two riding companions, Gareth Sutcliffe and Craig Tucker, are itching for some gravity-fuelled hijinks. And by making them wait while I go on ahead to photograph them in action, I’m keeping them from it. The light is at fault. The winter rays streaming through the stringybarks either side of The Great Race are so gloriously warm and so perfectly crisp that I feel compelled to preserve the moment through my camera lens. “It’s too beautiful not to,” I explain, a little guiltily. Since driving from Launceston to the former tin mining town of Derby, in Tasmania’s northeast, we’ve spent most of our time sweating and panting up a series of climbs that eventually spit us out at the Black Stump, a once-grand eucalypt anchored at a point where bike trails fan out in all directions. As one of three busy shuttle points around this fast-expanding trail network, it’s from this junction that two-wheeled troupes disperse across 100km of interlinked trails suiting riders of all levels. Already, the trails have taken two casualties from our six-strong group. Sydneysiders Don Robertson and Syl Malki have come to Tasmania for the first time to celebrate a milestone birthday for Syl. 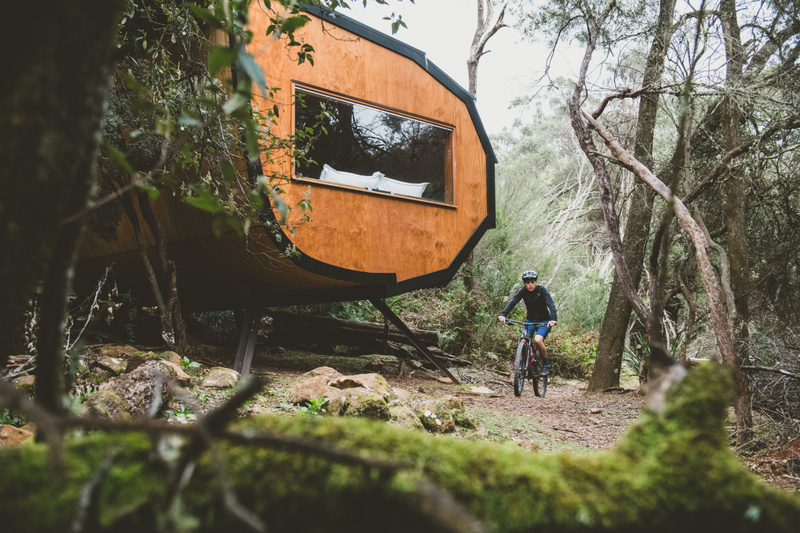 Syl's a keen runner, and the idea of thrashing it out on the trails, then flopping down inside Blue Derby Pods Ride’s cosy accommodation sounded like just the kind of pampered bliss her occasion called out for. Then reality set in. It was while labouring up Axehead and then traversing Long Shadows that Syl, a novice mountain biker, realised that she may have bitten off more than she could chew. After reassessing their options over lunch on a rocky creek bed just downriver from the Cascade Dam, the two lovebirds retired to the pods, having barely ridden downhill. It’s a pattern they fall into the following day as well, exerting themselves early then turning in for hot showers and bottomless glasses of wine while playing board games beside a wood-fired heater. They haven’t been alone in struggling either. While I’m not exactly a rookie when it comes to mountain biking, it’s also fair to say that I’m a long way off joining the Enduro World Series (EWS) that has staged events here in each of the past two years. Until now, it’s been more blow than flow for me, though I’d anticipated that – I was hoping that I’d improve steadily over our three days of riding. But even my mate Craig, who routinely racks up mile upon mile on his road bike back in Melbourne, has wrestled with his bike’s bulkier frame and handling. “I don’t want to crash and wreck them on my first day,” I say, somewhat sheepishly. But hopping off my bike for a moment also gives me the chance to admire the forest surrounding us. One reason Blue Derby has proven so popular since its first stage opened in February 2015 is the stunning scenery. 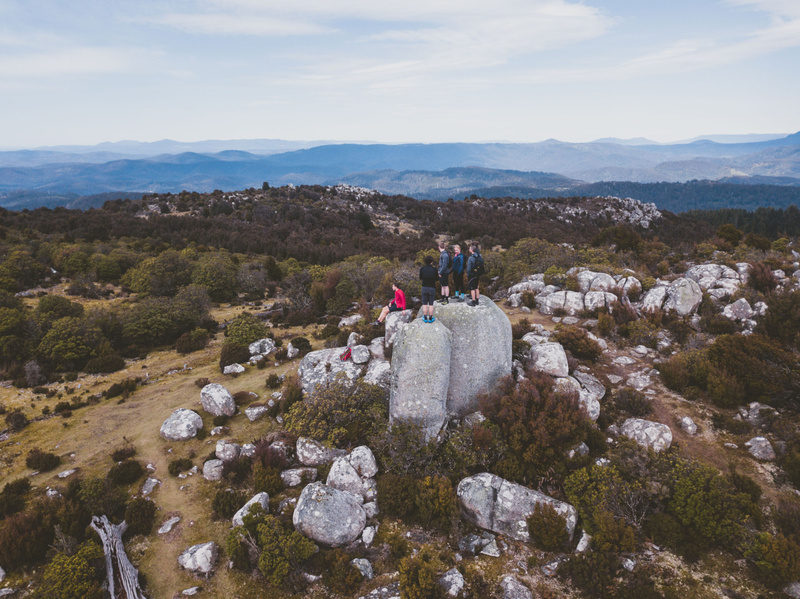 The trails pass through state forest reserves with sweeping views across rolling farmlands and the sweeping coastlines of Tasmania’s eastern seaboard. One minute we’re riding over granite tors in blazing sunshine, the next we’re cloaked in darkness beneath towering man ferns and autumnal myrtle trees. “The placement of a large boulder or tree or lookout often determines a trail’s route,” says Gareth. One trail, Sawtooth, has the best lookout point over town. Detonate squeezes between house-sized boulders a handlebar’s width apart, and Krushka climbs past a massive alpine ash nicknamed Big Mama. Another oversized tree acts as a beacon for Steve and Tara Howell’s trailside accommodation pods. It was only after a chance meeting with Jacobs at a cafe on Main Street that the Launceston-based couple were able to fulfil their dream of opening top-end accommodation for mountain bikers in Derby. “It was something that hadn’t been tapped into. We saw there was a gap in the market,” says Tara. World Trail had already been commissioned to build the Blue Derby trail network, and the Howells had spent months scouting for a suitable accommodation site when Jacobs, who by then knew the region’s topography inside out, suggested a spot beneath a towering white gum. 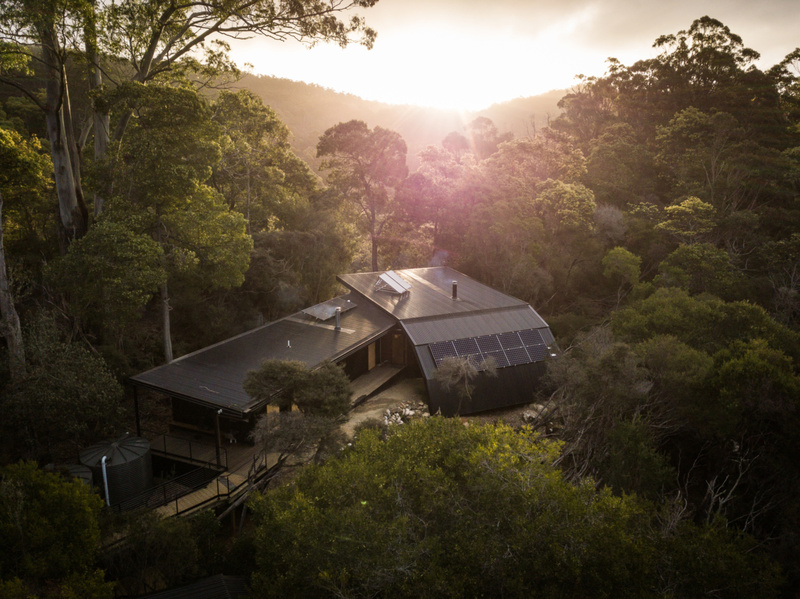 Blue Derby Pods Ride’s three-day all-inclusive package targets an older demographic wanting a soft adventure; riding the trails by day and then relaxing in comfortable surroundings with a gourmet meal and a craft beer or Tassie pinot in the evening. It’s to here that Gareth leads us at the end of our first day, where five off-the-grid accommodation ‘pods’ are connected to a communal ‘hub’ by a raised walkway. 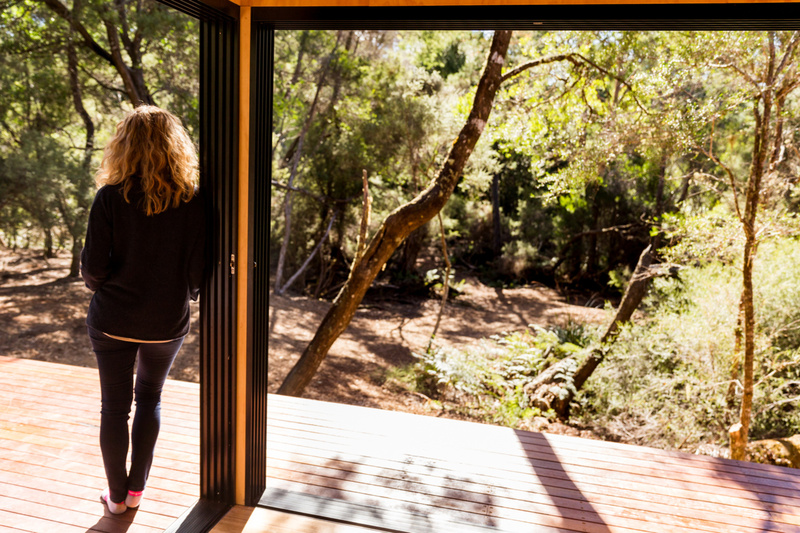 “We had a real mix of young builders and joiners and architects aged in their 20s with more ‘mature’ people working on the project, but the prerequisite was that everyone had to have a passion for mountain biking,” explains Tara, when I ask her about the building design. Just as the seaside Victorian hamlet of Torquay rode its surfing lifestyle into the corporate boardrooms of Quiksilver and Rip Curl, Derby is thriving on the back of its mountain bike trails which, in turn, act as a template for how a single attraction or activity can revive the fortunes of a dying community. Ever since the first 23km of trails opened more than three years ago, aided by $3 million in federal funding, the Scottsdale- based Dorset Council has placed visitor numbers in Derby at around 30,000 per annum, contributing an economic benefit to the area of more than $15 million and a further $15 million statewide. Parking rails decorate pavements, cafés and restaurants have opened, pubs have changed hands, more than 30 properties are now listed on Airbnb, and real estate prices have quadrupled – all because of the bike trails. The second stage added 13km of trails to the network, followed by Blue Derby’s first shuttleable descent, Atlas. The next crop of trails were launched around Derby and on the Blue Tier Range a year later, with a batch of (mostly) black diamond trails, including Detonate, opening ahead of the first EWS event in May 2017. A beginner’s trail aimed at attracting new generations of mountain bikers to Derby is currently being built around a lake that was once a gaping mine hole. And tendering was recently sought for the construction of a 46km descent from the Blue Tier to the Bay of Fires, as well as for a 66km stacked loop network south of St Helens. By the time they’re completed, more than 200km of trails will connect the resource-rich hills and streams around Derby with the white sand beaches of the coast. When that happens, Northeast Tasmania will rival the best mountain biking destinations in the world... if it doesn’t already. Both Gareth and Craig make it down the rock slab in one piece, after which the trail indeed adopts that ‘flowy’ trait Gareth had mentioned, describing a track that leverages a slope’s natural contours to avoid braking or pedalling whenever possible. From The Great Race, Gareth steers us down 23 Stitches then Flickety Sticks and onto Sawtooth – black, blue and green trails graded like ski runs, from advanced to intermediate to beginner. The following morning, Craig and I tag along behind our leader, Lauren ‘Loz’ Stranger, as she pilots us around Cascade Dam following what many consider Blue Derby’s prettiest trail, Dam Busters. We pedal through shaded gullies and beneath deciduous fagus trees. Tentacled fungi sprout from the soil and the minty aroma of sassafras perfumes the air. Then it descends, building speed through bermed turns on dirt that grips your tyres like nowhere else, and over punishing rock gardens that our dual- suspension bikes handle with ease. But we save the best 'til last, over on another mountain range. On our final morning, all six of us ride down from our pods to the trailhead, where we load our bikes onto a trailer attached to Steve’s van. After motoring through beef and dairy country and past potato crops and the occasional poppy field, we arrive in Weldborough, a one-pub town that – like Derby – prospered on the back of its metallic riches. Steve turns off the highway then climbs a gravel road to the plateaued mountaintop of Mt Poimena – Blue Derby’s highest point. From a starting altitude of 850m, we descend along an 18km custom-built singletrack that is perhaps the most wonderful mountain biking trail one could ever ride. From bouncing over boulder fields and sliding over slippery tree roots, then passing through an eerily thick rain forest that’s been ripped from the pages of a Tolkien novel, we begin a 500m vertical descent towards the historic Weldborough pub. Thereafter, I feel like I’m in cycling nirvana. So many cracking photo opportunities must be whizzing past my wheels but be damned if I’m ever going to stop; I’m having too much fun. My calf muscles strain and my faces itches, but still we ride on. There’s barely any need to pedal; we just pump the bumps and let gravity take over. If there’s biking heaven on Earth, then surely this is it. “That was absolutely brilliant,” says Don, who’s barely able to contain his excitement as we park our bikes outside the pub. “Do you think we could do it again?” he asks Steve.